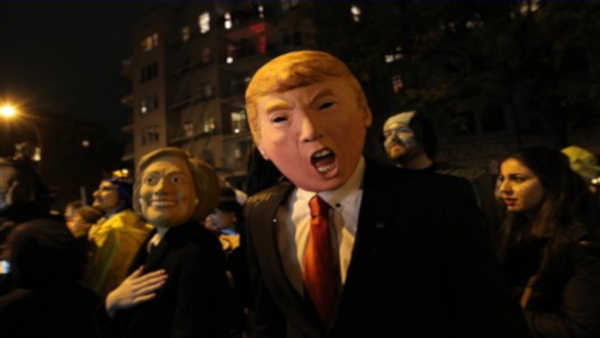 GREENWICH VILLAGE (WABC) -- Witches and skeletons marched alongside presidential candidates while a banana rubbed elbows with a jailbird, superheroes shared pavement with SpongeBobs and a butterfly strolled alongside a pirate on Saturday night as the annual Greenwich Village Halloween Parade made its way through downtown Manhattan. Maria Adobes, 27, was celebrating her first Halloween in the United States. The 27-year-old from Valencia, Spain, is completing a three-month research internship at New York University and said she had to check out the parade, which is touted by organizers as the largest public Halloween celebration in the nation. "I'm a skeleton, but with a little bit of glamour," she said as she admired the throngs of costume-clad revelers packing Sixth Avenue. "In Spain we have Day of the Dead, but there's no party." Hordes of spectators watched as thousands marched through the streets to loud music and collective cheers. Open to anyone in a costume, the freewheeling spectacle started in 1973 with a puppeteer marching with his family and grew into a televised extravaganza. For 49-year-old Kevin Dalton, the parade is a personal tradition. He's attended since it started 42 years ago. "There are a lot of parades in New York," he said. "But this is the most colorful and creative of all of them." While predictably rife with witches, zombies and other Halloween staples, the costume lineup tends to be something of a reflection of the news and entertainment of the times. This year, some celebrators touted costumes mocking presidential candidates on both sides of the aisle and others wore the uniforms of New York Mets players. Last year, marchers in hazardous-materials suits evoked the Ebola epidemic, the 2013 parade featured a number of people dressed as chemistry teacher-turned-drug kingpin Walter White from AMC's "Breaking Bad," and Occupy Wall Street supporters went as corporate vampires and "laissez fairies" in the protest movement's heyday in 2011. Valerie Taylor, of Winfield Park, New Jersey, spent months working on her costume: a detailed rendition of a character in the 1988 film "Beetlejuice," whose torso and fishnet-stockinged legs sit beguilingly - but separately - on a sofa. "I really love Halloween," she said.